Have you ever thought that you might like to grow a little bit of your own food - but thought you couldn't because you don't have a garden? Or perhaps you want to grow some healthy salads so you can have them super-fresh all year round, instead of buying expensive bagged salads already several days old - saving on the household budget at the same time? Do you think you don't have enough space? Well guess what? If you have a stepladder you're not using - then you have loads of space! Even if all you have is a path to your door with just room to walk - or only a balcony - then you do have room to grow something! 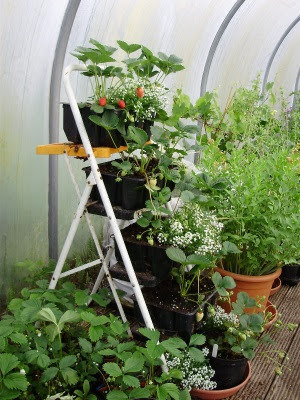 Using the space-saving stepladder method I invented years ago, when I didn't have a garden - you could have a very attractive and productive small vertical garden for growing salads, herbs, strawberries and other good things to eat all year round. If the stepladder's rather practical looks bother you - believe me - when it's covered with abundantly growing plants it's virtually invisible and you will hardly be able to see it! The pictures of my stepladder garden have always been so popular whenever I've tweeted about them on Twitter, and so many people have asked me about it, that I thought I would write about it to tell you exactly how I made it and what you can grow. First - you need a stepladder with broad enough treads to be able to hold suitably sized boxes for growing the plants in. Any box or pot that fits onto the treads and is deep enough to hold a minimum depth of 15 cm of compost is perfect. I find those large, loose mushroom boxes from the local supermarket are just the right size. They recycle those - so you can do it for them free if you ask nicely! If there are drainage holes in the bottom of your box - place a drip tray underneath, or failing that - put a piece of polythene inside the bottom, extending about 5 cm up the inside, to prevent water from draining down onto the plants below. Those rectangular cat litter trays available cheaply in the pet section of most supermarkets make very effective drip trays, which fit neatly on the average stepladder tread. You can put a box with a drip tray on each step, and then on the ground in front of the last step you can put either a large pot, or another box, on a plant saucer or drip tray. To fill the boxes I use a mix of 1/3 soil and 2/3rds organic, peat-free compost. The soil helps to retain moisture and also provides soil life like microbes which are important for keeping the plants healthy. After initial planting and watering in, most Mediterranean-type, hot-weather herbs like thyme and marjoram won't need too much attention other than occasional watering - but other plants such as salads may need watering daily, or even twice daily, in hot weather as they can dry out quickly. It's easy to remember to water them though, when you're picking delicious food from them daily. As they are so productive grown this way - the plants will exhaust their food supply fairly quickly in the small boxes - so after they've been cropping for a month or so - I then feed them about twice a week with a good organic plant food like Osmo, which provides naturally-made nutrients and I find excellent. You will be amazed at the amount of healthy food that you can grow like this and just how much money you can save! It's so flexible and easy that you can change what you're growing every year - or several times a year - whenever you like. Many plants are more than happy to grow this way as they have better light and good air circulation. Along with another large pot in front at the base - perhaps growing a few edible flowers like Nasturtiums or Calendulas - it can look really stunning and provides a lot of growing space. It's also a very convenient, 'no-bend' way for those with back or other problems to harvest produce - because the plants are always within easy reach for you to pick them. If you have a source of cheap stepladders - you could even have several and make a bank of them against a wall - giving you heaps more vertical growing space than you would have by growing just on the flat, in the same amount of space as the small stepladder footprint! Most stepladders are far cheaper than any of the undoubtedly smart but very expensive wooden structures you can buy for growing in. These can cost anything upwards of 200 euros and may also be treated with toxic wood preservatives! My re-purposed stepladder method is easy, cheap and productive - and if you need the stepladder for anything else - just remove the boxes for a few hours! If you don't already own one - you can buy a budget stepladder quite cheaply and the recycled boxes cost nothing! Set that against the price of buying any organic strawberries or salads (or even non-organic) - and the stepladder will be paid for in only a few weeks! So what sort of things can you grow? Fresh strawberries are always a firm favourite. If you grow alpine, 'perpetual', or 'ever-bearing' types which fruit for months, you could be picking delicious fruit from early May to the end of November in a warm spot against a sunny wall or in a glass porch. This year - I have Alpine strawberries on my stepladder garden - they've been producing their beautiful tiny flowers, which bees and butterflies love, since mid-March and they have been producing delicious fruit since early May. There's been a veritable waterfall of deliciously aromatic, small strawberries that smell of scented strawberry jam and taste like Heaven! Alpine strawberries can be grown easily and cheaply from seed sown in early spring and will start to produce their exquisite-tasting fruit in mid-summer from seed, but you would be able to pick fruit from the larger 'perpetual' varieties of strawberries much sooner. Many good online fruit nurseries such as Ken Muir now supply cold stored 'plug' plants of excellent perpetual varieties like Albion by post for most of the year. These arrive well-rooted in small convenient containers - ready to romp away as soon as they are planted. You could be eating these within just a few weeks! Strawberries really seem to love growing this way - because they get more light, warmth and really good air circulation, so they tend not to get moulds or diseases caused by damp. They also hang down very conveniently to pick and are naturally totally free from any possible slug damage! I've experimented with this method of growing all sorts of crops successfully over the years - so here are a few more ideas. The smaller culinary herbs are all happy growing this way - last year I had parsley, sage, rosemary and thyme steps. You could even grow your own tomato salad, with small varieties of bush cherry tomatoes on each step and a large pot of basil the base! Baby cucumbers and chili peppers also enjoy the extra warmth and light - producing a huge amount of fruits if you can sit the stepladder in a sunny porch. If you have enough space either side - you could also grow taller upright varieties of tomato in containers pushed half underneath the steps, and tying them up to the sides of the stepladder for support. Spinach, Oriental salad mixes, Mizuna, rocket, baby leaf kales and chicory, pea shoots, radishes and other salads can all be sown directly into the stepped boxes, or you could buy a few module-grown plants to plant if you don't want the hassle of sowing seed. These are all very happy - producing huge crops if kept well-watered. Super-healthy, nutrient-dense watercress can easily be grown from shoots gleaned from mixed salad bags and rooted in a jar of water. Planted into a deep box watercress grows extremely well if kept constantly damp. You could even grow smaller varieties of carrots which I tried successfully one year. (You can see some old scanned-in photos of those from over 30 years ago at the bottom of the article) It's a fantastic and fun way to grow lots of healthy food - whether you just have a tiny patch or no garden at all! Why not try growing something this way? If you do - you'll find the only way is up - for your health and your savings! The sky is quite literally the only limit - or your imagination! What are you waiting for? 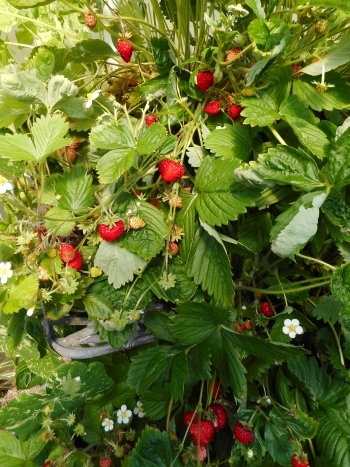 Alpine strawberry Reugen - cropping well on this year's version of the 'stepladder garden' Stepladder garden on path many years ago! High Rise Herbs!